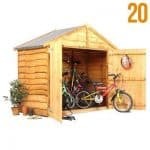 If you’re a bike fan or your children spend hours outside riding around then this is perfect for you as it will keep your bicycles clean and dry plus it looks great. 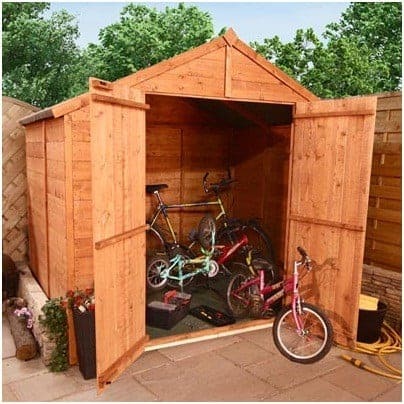 Not just for bikes or scooters, of course, you could use it for other garden or outdoor equipment such as the BBQ or children’s toys and it has excellent large double doors for ease of transporting your bicycles or equipment inside and out. 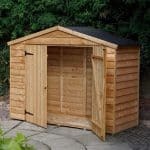 Made from sturdy wood so it will last for years and the tongue & groove cladding gives it extra strength. 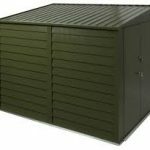 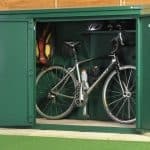 It is an attractive looking storage building which will prove hard wearing even in the worst of weathers. 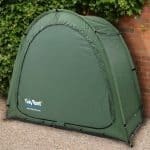 Available in other sizes too.